Once I become a cyborg, please remind me to get my immunization for Metalosis Maligna. 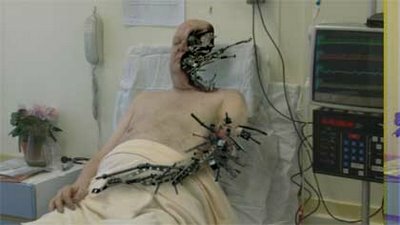 Via Next Nature: "Metalosis Maligna is a [fictional] documentary by Floris Kaayk about a disease which affects patients with medical implants. Sourcing from such implants a wild metal growth ultimately transforms human patients into mechanical looking constructions." Watch the video (54 mb, Quicktime).